FILE - People walk in the center of Afrin, Syria, March 24, 2018. A bomb blast in a northwestern Syrian town held by Turkish-backed opposition forces killed at least eight people Sunday, activists said, the latest in a series of attacks along the border where Turkey has troops. The spike in attacks follows Turkish threats to expand its offensive against U.S.-backed Syrian Kurdish forces, moving from the areas it currently controls in northwestern Syria to the east, where U.S. troops are also based. The U.S-led coalition against the Islamic State group backs the Syrian Kurdish fighters who have gained control of nearly 30 percent of Syrian territory, mostly in eastern Syria, after chasing out IS militants from there. But Turkey considers the Kurdish militia an existential threat and considers it an extension of the insurgency within its territory. FILE - People speak with Turkish soldiers in the center of Afrin, Syria March 24, 2018. Meanwhile in Doha, Turkey's foreign minister said if Syrian President Bashar Assad were to win internationally monitored elections, then Turkey and other countries would consider working with him. ``If it's democratic elections and if it's a credible one, then everybody should consider that,'' Mevlut Cavusoglu said, speaking at the Doha Forum held in Qatar. The Turkish minister said "credible, transparent, democratic and fair elections" must take place where Syrians inside and outside Syria can vote. More than 5.6 Syrians live as refugees in neighboring countries, the majority of them in Turkey. Besides its military operations, Turkey has been engaged with Russia and Iran, the two main allies of Assad in the war, leading cease-fire talks and efforts to form a constitutional committee made up of representatives of Assad's government and the opposition, which Ankara backs. Cease-fires have largely held, but the formation of a constitutional committee has stalled amid disagreement over representation. 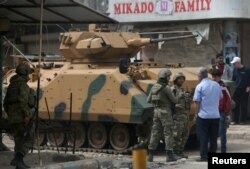 The Turkish state-run Anadolu news agency said four people were killed and 20 wounded. The U.S.-Kurdish alliance has soured relations between Ankara and Washington. Turkey views the main Kurdish militia as an extension of the insurgency within its borders. The U.S. military has set up observation posts to try to prevent friction between its NATO ally and the Syrian Kurdish militia.